This Poker glossary lists Holdem Omaha Stud terms plus rules for each game. Although Texas Holdem Poker is the favorite game for online poker players, Omaha holds a great deal of interest for players. 7-Card Stud poker is included because of its long history and the fact that this multiplayer game will never go out of style. Stud poker holds fond memories for veteran players while at the same time appealing to newer players. Each of the holdem omaha stud terms and mini-glossaries below begin with a brief overview of the rules followed by terms for the game. Holdem omaha stud page concludes with the Holdem Poker Report that details the best and worst starting hands. The casino dealer deals out two cards, face down, one at a time to each player. The first player to receive a card is the player to the left of the button. After all players receive their two cards, there is a round of betting where players can call, raise or fold. Checking is not allowed on this round, called blind betting. The dealer now deals three cards face up in the center of the table called the flop. Another round of betting begins. The dealer places a fourth card face up on the table followed by a betting round. The fifth and final card is placed by the dealer face up in the middle of the table, followed by the final round of betting. Players choose their best five-card hand among seven cards, two cards dealt face down at the beginning of the poker game, and the five community cards in the middle of the layout. The winning hand is the highest poker hand. Back Door: lingo for receiving a good hand with last two cards dealt in either holdem or stud poker. Big Blind: refers to the bets placed by participating players before hand is dealt, known as the small blind and big blind. Big Stick: Ace or King in the hole—great starting hand. There are several possibilities from this hand: high pair and/or high straight. Board: refers to the table center where community cards for all players are placed face up for holdem and 7-card stud poker. Button: the last player to bet. This is an advantage in that you have the opportunity to watch the other players before making a decision. Community Cards: center table cards placed faced up shared by all players. Drawn Out: a come from behind move that makes a winning hand. Flop: The first three community cards dealt and placed in the center of the table in the poker game of holdem poker. Fourth Street: refers to the fourth card placed on board followed by the third round of wagering. Holdem: poker game where players form the best possible 5-card hand based on 2 hole cards and 5 community cards. Also called Texas Holdem. Holdem Online Speed Poker: a fast-paced virtually non-stop version where decisions are made in about 15 seconds or you are declared auto checked or dead in the round. You gotta be ready for each hand. Middle Pair: If there are three cards of different ranks on the flop in Holdem, and you pair the middle one, you have a middle pair. On the Button: jargon for the last player to bet in a round. Overcard: a card that is higher than the highest cards on board. Pineapple: poker version, known as Crazy Pineapple online, is similar to Holdem in that players are dealt 3 cards each and must toss 1 card after the flop is dealt. Play the Board: occurs when the best hand that a player can make is the 5 community cards on the board. 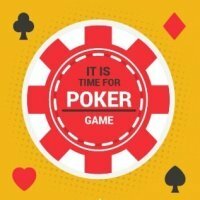 Pocket Pairs: with Holdem, approximately 1 in every 17 hands will be a pocket pair or 2 cards of the same rank while 4 in every 17 hand will be suited cards, thus a possible flush. 12 hands in 17 will be unsuited hands that could contain ranking cards and possible high pairs. Example is Ace of Spades and King of Hearts. Position Bet: refers to the betting position advantage of a player. Example: a player betting last is in good position to take the pot if no other player opens. Rainbow: flop that displays three different suits; therefore, a flush cannot be made. River: Final or seventh card dealt in Hold'em. Scare Card: jargon for that card dealt that can improve a hand noticeably. Spike: snagging that winning card on the turn or river card. Texas Holdem: alternative and original name for the game, now a shortened and accepted term is simply Holdem. Top Pair: refers to pairing the highest of the 3 cards in holdem on the flop. Turn: refers to fourth of five community cards in games like Holdem, 7-card Stud and Omaha. Also known as fourth street. There are two variations of this poker game, Omaha High only and Omaha Hi/Lo split. It can be played with the betting being a structured Limit game or you can find No Limit and Pot Limit games. After the blinds are posted, each player is dealt four cards face down with the player on the small blind receiving the first card and the player with the dealer button getting the last card. Dealer burns one card at the start of each round, and then 3 cards are dealt face up in the middle of the table known as the Flop. These are community cards used by all the players. When the betting round after the flop is completed, the dealer burns another card and turns a fourth card face up in the middle of the table known as the Turn. To determine the winner, the player MUST use two of his/her hole cards and three cards from the board to form the highest five-card hand. There may be a tie, which happens often in Omaha Hi/Lo. In that case, the players will split the pot. Baby: is a low card, generally a 5 or lower and offers the possibility of making a perfect low. Banana: same as a Brick, a card between 9 and a King. Brick: jargon for a card between 9 and a King as it is unlikely to qualify for an 8 low. Escape: you have just snagged a card that will likely win half the pot. Free Roll: a nice position. You are guaranteed the high or low plus the possibly of winning the other half puts you in a free roll. Lowball or Low Poker: a 5 or 7-card version of Omaha where the lowest hand wins. Quartered: a split between two players for half the pot. River: Final or seventh card dealt in Omaha. Runners: two consecutive cards that boost your hand. Scoop: you have just won the whole pot—Congratulations! Wheel: a very strong hand containing A-2-3-4-5 is termed a wheel because it counts as a perfect low and a five high straight. Each player receives seven cards; therefore, the number of players in this poker game is limited to seven or less. 7-card Stud has five betting rounds. Each player is dealt two cards down and one card up. The two cards face down are called your hole cards and the up card is referred to as your door card. The first betting round is called 3rd street followed by 4th, 5th, 6th and finally 7th street. After seventh street, each active player has four up cards and three hole cards face down. There is a final betting round and all players show their hands after the betting is complete. The highest five-card hand wins the pot. 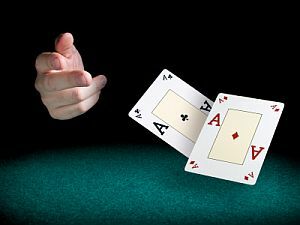 Bring In: once all cards are dealt, the lowest card on the table must make a small bet of approximately 1/3 the size of the lower limit set, and cannot fold. Buried: referring to the first 2 cards dealt face down or 'in the hole' that consist of a pair. Door Card: First upcard dealt in a round of Stud Poker. Fifth Street: term for the third betting round when each player has 5 cards. At this juncture in the round, betting limits double and some players fold. Fourth Street: term for the second betting round when each player has 4 cards. Going to the River: remaining in the game until the final or seventh card. Hole Cards: two cards known only to the player thus held ‘in the hole’. Pocket Pair: dealt a pair in the hole. Pocket Pair term is used for both Stud and Holdem. Rag: poker jargon for weak hole cards. Rolled Up: referring to the first 3 cards dealt face down or 'in the hole' that is 3-of-a-kind. Seven Card Stud Poker Game: in brief, players can use 5 of the 7 cards dealt to form a hand. Seventh Street: jargon for the fifth and final round of wagering when each player has 7 cards. Sixth Street: term for the fourth betting round when each player has 6 cards. Street: refers to the betting round that occurs after a specific number of cards are dealt. Stud Poker: general term for this version of poker. Third Street: term for the first betting round when each player has 3 cards. Turn: Your fourth card received to include the two hole cards already dealt to you. This report details the best and worst starting hands. Holdem starting hands refers to the first two hole cards dealt to poker players. Based on the strength of these 2 cards, the decision to bet and/or stay in the game will be made. For this report, the strength of the starting hands is rated when nine or ten players are at the table. High suited cards are worth a small bet early and depending on the stakes, possibly in late position also. 4) Ace and King: of the same suit. 5) Pair of Jacks: unless the flop shows a Queen, King or an Ace. 6) Ace and Queen: this suited hand is in the same league as Ace and King. 7) King and Queen: if suited—even better, unless the board reveals an Ace. 8) Ace and Jack: suited or unsuited may evolve into a winner. 9) King and Jack: suited=a Holdem best, however unsuited=not so much. 10) Ace and Ten: there is a reason for the #10 rating as this starting hand can tumble by hands #1-9. In the end, the top ranked possibilities are pocket pairs of Aces to Queens followed by suited cards Ace-King and Ace-Queen. As the game progresses, the real skill is with your instinctive knowledge of whether to continue betting or not. The ability to recognize and run a bluff is also an essential strategy. The low straight draw possibility is a long shot with this combo. The only good news is that a pair of 8s beats a pair of 7s. Nothing to cheer about here. Possible pair of tens–nah, move on. Not likely a straight draw, so next hand please. Unlike #6 above, there’s not even a possible straight here. Probably the worst of the worst here. Go for the fold here and fight another day. Notice that all 10 hands above can easily be bettered by a pair of Aces, Kings, Queens or Jacks. The opportunity for a win is slim to none, so walk away fast! Holdem Omaha Stud Terms is Part 2 of 5 for the Poker Glossary at gamerisms. Holdem Omaha Stud, Part 2 concludes with the Holdem Poker Report that details the best and worst starting hands.